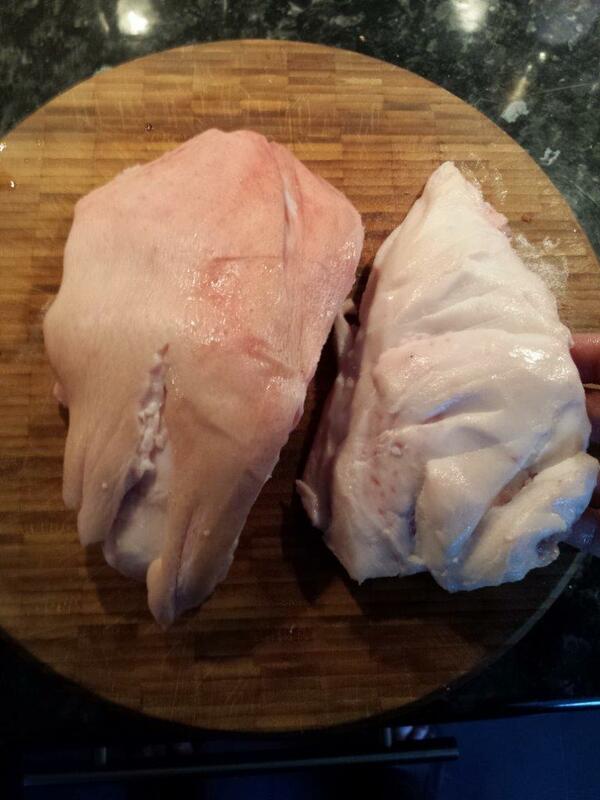 Take two pigs cheeks (medium size), remove the skin with a sharp knife. Prepare the marinade by crushing all the whole spices and roots in a pestle and mortar till a fine paste. Mix all the other spices and liquids into the paste in a ceramic marinade dish. Add the pigs cheeks and rub all the spices into the flesh. Cover the dish with cling film and refrigerate for 23 hours. Before cooking remove the cheeks from the fridge to come to and then cook for 30 minutes on a high heat to seal before turning the cheeks right down to 150C (or close to) to slowly roast. The dish to be placed over a trivet and water bath of fluids from the marinade and some hot water for the entire cooking time. After the cheeks have been in for about 3 hours or until tender. You can baste the cheeks every half an hour to keep them moist if so desired. Allow to rest for 20 minutes before carving into thin slices and serving with a plain rice and steamed bok choi. The cheeks are very rich so about ½ a cheek per person or less!